Filtered water at the airport! What "thing" do you most need while traveling? I imagined missing my pillow, comfortable bed, access to clothing packed away, or maybe a favorite cast iron pan. In actuality, the thing I most need and want is clean, clear, safe, water. Ever since watching the documentary Tapped, I've not been comfortable consuming water from plastic bottles. Not even the disastrous effects of fracking, which was in progress just a few miles from my Los Angeles location, brought me to purchase plastic jugged water. One afternoon, my host in L.A. suggested that we watch Gasland, an insightful documentary about fracking, which had me wondering what was in that southern California drinking water? The smell of chlorine stood out and the taste was confusing. I decided to stop drinking the city water, coupled with refusal to buy plastic bottled water, which led to the dragging effects of dehydration. Water, I needed good water! A few days later, I had the urge to book a ticket to the Land of 10,000 Lakes for a home visit. 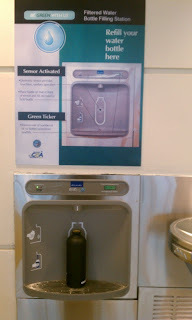 Spotting a filtered water machine at the Chicago Midway airport, I wondered if it was a mirage! It invited me to "Refill your water bottle here." The machine calculates how many plastic bottles are saved by using a water filling station. I drank one down and then another. I felt like a dehydrated apple coming back to life. The taste of this water was divine and it had a brightening effect on the way I felt. A delayed connecting flight ended up being a blessing for my body. It kept me near that machine for the next few hours, rehydrating and thinking about the preciousness of water. It was definitely a stretch (of my interests) to attend a Power yoga class in Santa Monica. I knew the class would not be paced or styled to my preferences, but it was the studio my friend had enthusiastically chosen for us. Keeping an open mind came in handy while the studio filled up with the latest yoga fashions and serious looking faces. A woman in the bathroom was using large handfuls of paper towels just to open the door and avoid contamination. I thought about waste and wondered if I was doing that with my time. I made a silent vow that I would not do anything injurious for the sake of keeping up. To my delight, the class began with a lengthy child's pose. Ahhh. Worries about what may or may not happen in class washed away. Only the feeling of my forehead touching the floor seemed to matter. We moved into Sunbird, and after that, it was all vigorous flow for another 85 transformational minutes. No, this was not my usual way of practicing. Yet, I found the entire class to be beneficial and exactly what I needed that day. I had to redirect my focus a few times to include only my experience, not the woman on my left who might be throwing her knee out trying to keep up. One man rolled up his mat and left shortly after class began. I felt relieved by his brave act. Sometimes getting out of what feels like a dangerous or unhelpful situation is the best possible answer. That man was practicing yoga by choosing to leave. I hoped that everyone there had the wisdom needed to make it through safely and honorably. Then, I let go of my distracted concern for others in order to stay present for myself. If we can not mind our own selves, what makes us think we can skillfully mind other people anyway? The yamas and niyamas emphasize being truthful not only to others, but to ourselves. Truthful about what feels right and what doesn't. They also emphasize non-possessiveness. There were a few moments when I wanted to execute a complicated pose just to have it and "prove" myself. Fortunately, inner wisdom directed me towards surrendering ego and excess. Life, like a power yoga class, sometimes hands us things we couldn't have thought of for ourselves! We have a chance to creatively stretch in every situation that rolls our way. Before the start of any yoga practice, I like to survey the premises for possible yoga props. Walls, tables, belts, sand bags, and chairs are among some of the usual yoga prop choices. I rarely miss the chance to use steps, boulders, trees, shelves and anything else that can help expand or support a yoga posture. When I spotted a hula hoop from across my friend's living room, I knew it would be the guest prop for my practice that day. It was the perfect size for holding above my head, which made for nicely energized arm raises. Then, it became a noticable stablizer for First Warrior pose, as I lightly touched the hoop at my side for greater balance and strength. The hoop helped me to avoid over efforting. I felt encouraged to find a deep place in the pose. This deep place wasn't overly concerned with outside appearance or striving for perfection. This deep place was where sensations were noticable. At the sensation level, there is nothing more to "do". I finished the hoop practice with some twists. As I held the circle at shoulder height, parallel to the floor, my sitting twist was encouraged to spiral honestly and evenly. Nothing to prove, nowhere to go, the hoop seemed to say. I wondered why it felt so natural to make use of the hula hoop in yoga. Maybe the symbolism of a circle brings a needed balance to all of the lines, rows, rectangular mats, and angles that typically stand out in yoga poses and class settings. I'm inspired to bring more circles and spirals onto my mat and into my visions. Circles represent infinity, unity, and wholeness. At the end of my practice, I sat inside the hoop, feeling a welcomed reminder that we are all in the circle of life.